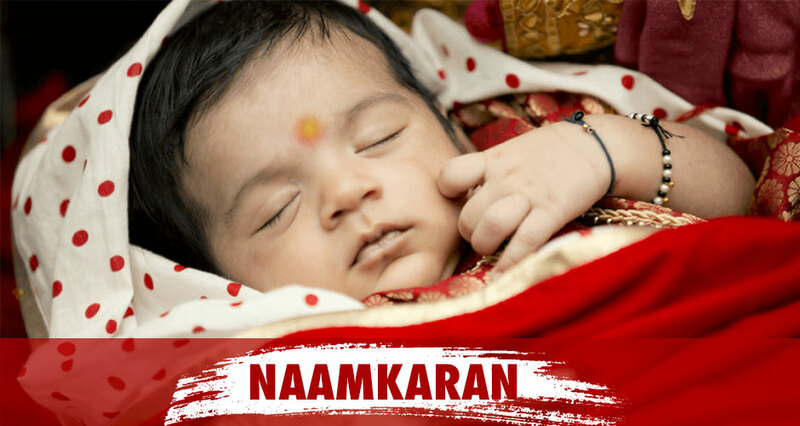 Naamkaran or naming ceremony is a very important Hindu ritual after the birth of a child. It is a formal ceremony held in the presence of family and friends. Naamkaran is a Sanskrit word which can be broken down as Naam – name, and karan – create. It is one of the 16 Hindu samskaras or rituals that are to be conducted for every person taking birth. This ceremony is performed by most of the castes and communities under Hinduism but the rituals may vary according to the region. Depending on the regional beliefs and practices, this ceremony is sometimes conducted within a few weeks or few months of birth. Naming ceremony is a very happy ritual, and usually the first major Hindu ritual for the baby. After the extra-careful days of pregnancy and the tension of childbirth, this is the time when friends and family get together to celebrate the new arrival and the child also gets formally introduced to friends and family. When is the Naamkaran held? According to the Hindu tradition, naming ceremony should be held after the Jaatakarma which is conducted immediately after birth. However, this ceremony is rarely conducted these days as most births happen in hospitals. This ritual involves the father of the newborn feeding honey and ghee to the newborn. Naamkaran should held either 11 days after birth or on an auspicious day chosen by the astrologer. However, it should be done before the child completes one year. However, this ceremony should be avoided within the first 11 days of birth as both the mother and the baby have to recover from the stress of childbirth. How is the name chosen according to Hindu tradition? Most Hindu families rely on astrology to choose a name for their child. The starting letter of the name is always recommended to be according to the “birth star or janma nakshatra”. Sometimes, the first letter is chosen according to the date of birth or the planetary positions at birth. 1. Maasa Naama – The name is chosen according to the month of birth as in Hindu calendar. 2. Nakshatra Naama – The name is chosen according to the birth star or janma nakshatra. 3. Kuladevatha Naama – The name of the family deity is chosen. 4. Raashi Naama – The name is chosen according to the sun sign or the moon sign at the time of birth. 5. Vyavahaara Naama – This is the name by which the parents and the family would like to address their child. Sometimes, the child may be given the name of a grandparent or a deceased ancestor. How is the Naamkaran ritual performed? Even though this is a typical Hindu ritual, it largely varies depending on the community and regional practices. The ceremony is led by a priest. The mother and father start the ritual with a prayer and chanting of vedic mantras by priests. Sometimes, a havan/homa is also performed before the naming ceremony to pray for long life of the newborn. The priest offers prayer to the Gods, the 5 elements (Agni-Fire, Bhoomi- Earth, Aakash – Space, Jal – Water and Vayu – Air) and the spirits of the ancestors. The father writes the names chosen on rice which is spread on a silver plate. The vyavahaara naama is whispered by the father into the child’s right ear thrice. In some communities, the paternal aunt or maternal uncle whispers the name in the right ear and in some communities, any of the grandparents whisper the name. This ceremony is followed by the parents of the child taking blessings from the elders of the family. The family members and friends then shower the child with various gifts. Family members usually gift gold ornaments, silk clothes, silver coins, cash etc. Nowadays, everyone prefers giving gifts which can be of great utility to the parents such as prams, cribs, high chairs, bathtubs, blankets, winter wear, clothes etc. In some regions, naming ceremony is followed by other rituals like cradle ceremony and ear-piercing ceremony. Cradle ceremony is performed by placing the child in a decorated cradle in a ritualistic manner. In the ear-piercing ceremony, vermilion is used to put a dot on the child’s ears at the spot to be pierced. A goldsmith skilled in ear piercing or a doctor is called to pierce the baby’s ears. Gold earrings presented by the maternal grandparents are inserted to the pierced ear. 1. Preferably choose a name that can be easily pronounced and spelled. 2. If you choose a Sanskrit name, it is always recommended that you chose a name which is a noun and not an adjective or superlative. 3. Many parents prefer to keep names which are derived from Sanskrit. The Sanskrit nouns are classified into masculine, feminine and neutral genders grammatically and not by its meaning. Make sure that you choose an appropriate word which matches the gender of your baby. 4. If you choose name in Greek, Persian etc., make sure that the name does not have an unpleasant meaning in Indian languages. Also Read: Is applying kajal in baby’s eyes safe?